“Peonies in the Wind” by Sakai Hōitsu (1761-1828), Edo Period. It’s been 16 days since The Butterfly Crest launched, and I don’t think I’ve stopped for even a second. I knew my plate would be full the second everything went live, but I couldn’t have guessed the full extent of it. The work is never-ending. I had a game plan, but every time I finish a task three take its place. I’m learning something new with every click of the cursor, and the process seems to reinvent itself every day. That being said, I’ve enjoyed every second of it. The pace might be a little insane, but connecting directly with readers, and other writers, has been a joy. I received my first reader email halfway through the week, and it was from the mountains of Turkey! I’ve been thinking about what to write (it’s hard to pare down the experience), and the first thing that comes to mind is the incredible support I’ve received from friends and family. I’d given the book to less than a dozen people before its launch (to assist in the revision process), and all of them went out in full force to spread the word. They’ve shared and promoted the book through social media almost as tirelessly as I have. They are fully invested in the book’s success, and I’m in complete awe of them. There’s also the ones who are doing exactly the same thing, without having been part of that peer review group, and the ones who, in spite of not owning ereaders, downloaded apps, purchased the book, and are reading it on their phones (which I can tell you from experience is NOT an easy task) and spreading the news. There aren’t sufficient words in the English language to express my gratitude for their support. And while I’m on the topic of supportive friends and family, I can’t leave out the unexpected gift I received in the mail. On Tuesday morning, I arrived at the office to find a package waiting for me. The box had the logo of a tea retailer and weighed very little, so I imaged someone had sent me some tea (which for me is like gold). When I opened the box and removed the tissue paper, what I found wasn’t tea. Staring back at me was a white butterfly crest, in a sea of black crepe silk. It was a haori, a kimono jacket, with a singular butterfly kamon at the nape of the neck. Kamon is the Japanese word for a family crest, and the inspiration for the name of my novel. One of my dearest friends had sent me the gift to commemorate the launch of my book. And once again, there weren’t sufficient words in the English language to express my gratitude. Which brings me to the topic of butterflies. In the email I received from Turkey, the reader described an experience she had with a swallowtail butterfly while she was reading the book. In that moment, I realized how powerful a symbol it can be, that it had resonated with her in the same way it resonated with me. I have to admit that I’ve never quite looked at a butterfly in the same way again, since finishing my book. What’s incredible about it is that I didn’t set out with the intent of the butterfly becoming the symbol for Elena’s journey, or mine for that matter. It was just one of those happy occurrences while I was writing. Now, I can’t imagine this journey without it, and every time I see one (yesterday afternoon in my backyard or the photo of one a friend posted on Facebook this morning) I can’t help but feel completely at peace. The experience of writing my first novel, of fulfilling that dream, and publishing it has been transformative, and the butterfly, for me, has become a symbol of that transformation (in the same way it was for Elena, and in the mythos of different cultures throughout history). Speaking of Elena, it’s been a huge relief to see the warm reception she’s received as our reluctant heroine. When you’re writing a story with a large supporting cast of divine creatures, who are forces of nature in their own right, you can’t help but worry that the voice of your human protagonist might be overwhelmed. Even in my head, the cast of beasties fight for room on the page while Ele usually just sits back, but it looks like that contrast resonated with readers. Both of the editorial reviews the novel has received have commented on Elena’s strength as the protagonist, and I’m thrilled about it. Which brings me to the second editorial review—The Butterfly Crest has received another 5 stars! I can’t think of a better way to close out this post. 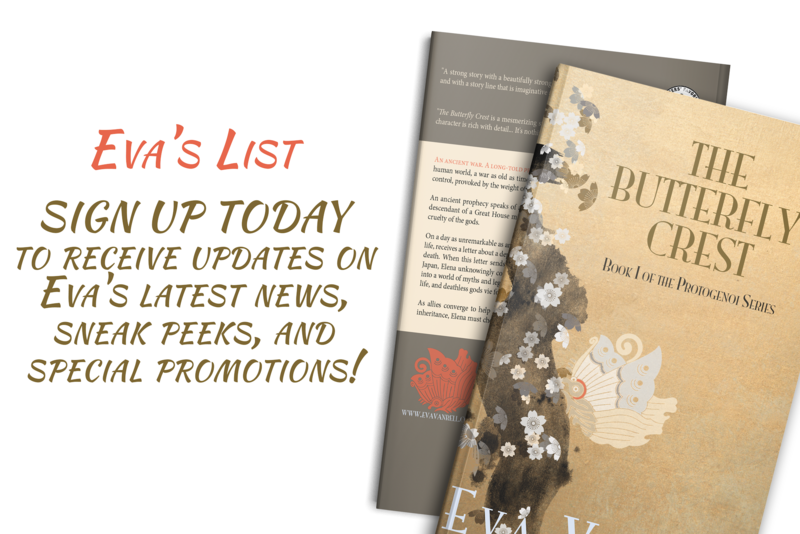 The Butterfly Crest by Eva Vanrell takes us between the shadows of the human world where a war that is as old as time is raging. A long-told prophecy says one human woman will change the course of the divine war and one day Elena – a seemingly regular woman living a normal life – gets a letter about a deposit box in her mother’s name. This letter and the contents of the box are a cursed inheritance and send Elena on a journey that could only be considered mythical and unbelievable. She must make choices to see where destiny takes her. This is a great story that merges two different realms almost seamlessly into one another and makes a complex story entertaining and compelling. The action was fast and the pace of the book was perfect. Elena is a fantastic character whom I found to be intelligent and strong, but who has to find her way in an impossible situation, giving her even more depth as well. Eva Vanrell has created a strong story with a beautifully strong female main character, in a world and with a story line that is imaginative and unique. I have read many fantasy style stories that offer a similar version of wars that have been going on for all time, but this has been by far one of the most well thought out and well put together plots. If you are looking for a read for the summer that will have you hooked within the first pages and hold your interest until the very end, leaving you wanting more … then this is your book. 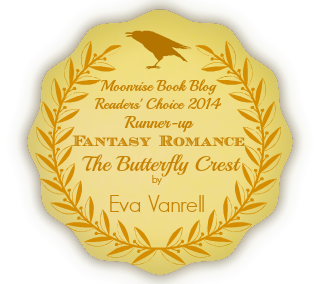 The Butterfly Crest by Eva Vanrell is a fantasy filled fiction that is contemporary and exotic. Elena Vicens’ life takes a turn when she receives a letter one day regarding a deposit box belonging to her mother. This letter comes to her nineteen years after her mother’s death and the letter sends her from New Orleans to Japan. She finds herself in possession of a cursed inheritance and the story takes off from there. Readers find themselves in the midst of legends and myths, the strangeness of everyday life, a human woman who will shape the outcome of the divine war and, amid all this, Elena must choose her own destiny. It is an intriguing, imaginative and very original story with many layers and that makes it a compelling read. It moves between the tangible and intangible, giving the story a surreal feel and keeping readers guessing about the outcome. The narration is descriptive and gives more clarity to the plot. It is an exceptional read. Elena is an interesting character that has been portrayed vividly and wonderfully. Her presence dominates the story throughout, holding the plot together. There is a mysterious vibe in the theme, enhanced by the description of Elena’s character. The shifts in the story that occur between the two locations and the afterlife give it a new dimension and make it an even more attractive and exceptional book to read. Truth be told, I don’t even know where to begin. My mind is a jumble of too many thoughts. That said, I’m just going to jot them down and hope they come out coherently. If they don’t, my apologies. After much toil and four proofs, it’s official — The Butterfly Crest is now published. It’s been distributed to the various eBook retailers and should be available at all of them within the next four weeks. It is available now through iBooks/iTunes, Amazon Kindle and the Bookshop. Barnes & Noble should have it listed in 2 to 4 weeks. It will also be available through Kobo, Oyster, Copia, Scribd, Gardners, Flipkart, Baker & Taylor, and eSentral. Keep an eye out for the Goodreads listing, which should be up soon! If you’ve heard that announcement before, I apologize for the repetition, but I wanted to put it up as a regular post (not just a status). For the past 14 years, my cast of characters has existed in the aether. Their world was limited to the mind of the author and a single reader. That audience has expanded slowly these past 3 years, to include a few brave souls who took a leap of faith and believed me when I told them I could write (they knew my passion for it, but passion and ability are two very different things). Now, Pandora’s box is wide open. My cast of beasties (and trust me, you’ll understand why I call them that once you read) has gone public and there’s no turning back. They have shaped and colored my life these past 14 years, and if they can do a fraction of that for you, bring you the smallest bit of joy, then this journey was well worth it. Which brings me to my third thought… how much we, as authors, put of ourselves into our books. I never thought publishing would make me feel vulnerable, but I have to admit it did so immediately. A click of a button and suddenly (relatively speaking), your work is out there for the world to see. Yes, you expect and try to prepare yourself for criticism, but that isn’t really the flavor of vulnerable I’m experiencing right now. I poured my heart and soul into this book, and left a large part of myself in it. As you read, you’ll experience the obvious things, like my passion for mythology, my awe for Japanese culture, and my obsession with ancient Greece; but what about the not-so-obvious things? It was Plato who said, “You can discover more about a person in an hour of play than in a year of conversation.” In my case, you can substitute play with my writing. Just an hour of reading, and you’ll know more about me than you would have working beside me for five years. Of course, you won’t know which parts are me, exactly, but that doesn’t make the experience any less intimate. That intimacy might be almost entirely one-sided, but the act of sharing it is deeply personal, and a little terrifying. I love to be affected by what I read, and in writing I aim to do the same for my readers. As long as my words reach you, I’m satisfied. If you are able to escape, to laugh, to cry, to feel and connect with my characters, then my hope has been realized. Sales, numbers, platform—those things are necessary, but they aren’t the reason I write. The reason I write is made clear when my mother calls me defiant, refusing to read on because she can’t differentiate between me and a character; or when a friend calls to tell me he thinks of my book now every time he drives by the New Orleans Museum of Art; or when another friend uses my own characters to encourage me (“Cataline would approve,” indeed!). That is the reason I write, and those moments will be how I measure my success moving forward. As a final note, today’s image is Kitagawa Utamaro’s “The Courtesan Ichikawa of the Matsuba Establishment.” Utamaro was an Edo period ukiyo-e artist, famous for his portraits of female beauties known as bijin-ga. His work reached Europe in the mid-ninteeth century, and even influenced the Impressionists. The reason I chose this image, other than the obvious fact that it’s quite lovely, was because of the detail in the fabric (it reminded me of a fusuma door I describe in my book). The Butterfly Crest has officially been distributed to all eBook retailers! It is available now (for all eReaders) through BookBaby. It will be available through Amazon Kindle mid next week, and the iBookstore in 1 to 2 weeks. Barnes & Noble, Kobo, Copia, Scribd, Baker & Taylor, Gardners, eSentral, Oyster, and Flipkart will carry it in 2-4 weeks. I’ll keep you posted as the links go live. Your reviews are welcome! !